1. Find another yeast that produces a clean mead as quickly as Wyeast 1388. Dry yeast version is a plus here for cost, shipping, and ease of use. 2. Test the ester profiles of various yeast strains for improved aromatics. This test doesn't care about fast drinkability. Just a wonderfully aromatic end product. Here are the yeasts I've chosen for this experiment. For each, I'll give name, ABV tolerance, background, and my logic in trying them. Control yeast from the BOMM. It's been documented extensively. Goal 1 is to do side by side testing to find a yeast that performs equal to or better than Wyeast 1388 so this is needed for a control. Notty is an English ale yeast. Lots of folks use it in ciders because of its clean profile. I've been told conflicting things in mead. Some people say it's very good and other people say it's not. I guess I have to test myself. This yeast is actually a Cask & Bottle Conditioning ale yeast. It is advertised to carbonate high ABV beers by adding at bottling. My logic is that a yeast used for bottle carbonation should be neutral, have minimal off flavors, and tolerate high ABV like a champ. Let's see how it treats mead. This is one of the few dry Belgian ale yeast that I'm aware of. Since I've had good luck with Belgian ale yeast, let's give it a go. I was a bit concerned it may have some saison character (read barnyard), but nothing ventured, nothing gained. Vierka Mead Yeast - 12%-25%?! This is a difficult to find and very interesting yeast. It comes to you dried on grapes skins. You basically have to make a small starter before pitching. At a local beerfest, one of the Meridian Hive mazers told me they use Vierka yeast. He also said the mead was 7 weeks from pitch to bottling! I tasted his mead and it was the first commercial mead I've ever been impressed by. Granted, Meridian Hive meads are hydromels (7%), but perhaps it will still be clean with standard strength mead. This yeast is a wine yeast. I've heard good things. I don't expect this to be a fast yeast, but I do want to test the ester profile. Apparently, it is the closest thing to the legendary "Maury" yeast used by Brother Adam's that we can ever get. I really like throwbacks to historical mead making, so this is a must. In previous experiments, I've found Fermaid O to produce a very aromatic mead compared to the standard BOMM regimen of Fermaid K and DAP. As a result, I used Fermaid O for SNAs. Typical K2CO3 pH buffering remained the same. Temperature was 72 F consistently throughout the experiment. 1. Woke up a packet of Vierka dry mead yeast in half a cup of water with equal weight of GoFerm. 2. After 15 minutes, I added the rehydrated yeast to a 1 cup starter with OB honey to 1.060 and 5 grams Fermaid O. 1. Remove 0.5 cups from each jug for rehydration of yeast. 2. Drew a line at this level. 3. 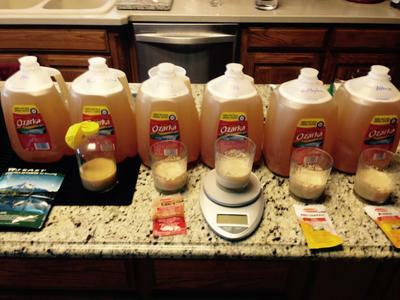 Removed 3.33 cups (790 ml) from each jug. 4. Added 2.5 lbs of OB honey to each jug by filling back to the line. SG = 1.100. 5. Added 1 TBSP (~10 grams) of Fermaid O to each jug. Since I am going for improved aromatics, I'm useing Fermaid O as opposed to Fermaid K + DAP. I've found the Fermaid O product to produce a superior aromatic mead. -Added again at 1.066 and 1.033. 6. Add 1/2 tsp KHCO3. One time addition. 7. Shake vigorously to dissolve all honey. 2. To 0.5 cups of water, add equal volumes of GoFerm and dehydrated yeast (11 grams each). I added GoFerm first and stir to mix, then sprinkle the yeast on top. After it stands for a few minutes, I mix again. -Vierka requires a starter and began on Day -2. -Wyeast 1388 is a smack pack. I activated >1 hour before pitch. Results are in! I tasted all of these straight out of the fermenter at room temperature. Appearance: Mostly clear, but some lingering cloudiness. Aroma: Orange blossom. Bubblegum and peaches. Taste: Very dry and light bodied. Some orange blossom coming through with peaches as well. Also, a faint tartness present. Clean. Appearance: Slight haze, almost clear. Aroma: Strong orange blossom. A bit of underlying bread yeast smell, but in a complimentary way. Taste: Extremely clean and focused orange blossom. Slight tartness. A bit more body than 1388. Overall: This is a stellar yeast! Aroma: Orange blossom with beeswax. Peaches in the background. Taste: Orange blossom with some beeswax. Slight tartness. Light body. Overall: This yeast is comparable to Wyeast 1388, but not as peachy. Very clean though. Aroma: Sulfur and Parmesan cheese. With intense swirling, the undesirable smells dissipate and orange blossom remains. Taste: Thankfully, it tastes nothing like the initial smell. It has some orange blossom and fusels, but the flavors are muddled and unfocused. Appearance: Almost crystal clear. Very slight haze. Aroma: The most aromatic of the bunch. Grape aroma dominates,but some orange is present. Taste: Very tart and the dryness is pronounced. There is a grape flavor that dominates the orange blossom. Some fusels present, but trace. The finish is almost a bit bitter. Overall: It's not bad, but the yeast esters dominate the varietal honey. Aroma: Orange blossom with beeswax. Taste: Very tart with noticeable alcohol presence (trace fusels). A subtle, wine-like representation of oranges. Very different from the in your face orange of the ale yeast. Overall: Good, but wine-like with subtle flavors. As predicted, it needs age. I think it's safe to use Abbaye or CBC-1 dry yeast as a substitute for Wyeast 1388 as long as you rehydrate with GoFerm. Goal 1 (dry BOMM yeast) accomplished! So far, Abbaye and Vierka are winning on aromatics. Very different, but very good. I think time will tell on this. The yeast are entering dumb phase. I predict 6 months of age will be needed to judge aromatics. Periodic tastings will be added as these meads age! Aroma: Intense orange blossom with some peachy notes. Taste: Orange blossom and peaches. Finishes dry with some butteriness. Aroma: Beeswax and orange blossom. Taste: Very tart orange blossom. Clean of all fusels. Overall: A bit more tart than I'm use to, but very good. I predict this will age out nicely. Aroma: Grape and orange blossom. Taste: Slightly tart orange blossom with a hint of peach. Slight clove like sensation on the tongue. Difficult to tell if it's fusels or phenolics. Overall: Quite good. A bit more age should bring the flavors into focus. Aroma: Very muted orange blossom. Difficult to smell, but focused. Taste: Orange blossom Chardonnay. Ever so slight fusel. Laser focused with little complexity. Overall: Very good yeast for wine lovers who want a straight forward, focused profile. Aroma: Strong nose of grapes with orange blossom returning. Taste: Very light bodied with a grape like flavor. Slight tartness. No fusels. Overall: Feels like it hit a dumb phase. The intense aroma diminished and it tastes hollow. Aroma: Sulfur is nearly gone. Orange blossom is returning. Taste: Yeast bite with orange blossom returning. Fusels present. Overall: Age cures all ills. Aging 6 more months will fix this. Concerning aromatics, only the first 3 on the above list are very intense. Keep in mind that many of these yeast maybe entering a dumb phase. At 6 months, the rankings may be completely different. Taste: Orange blossom and peaches. Finishes dry and tart with some butteriness. Aroma: Beeswax and orange blossom. In that order. After swirling, the orange blossom dominates more. Taste: Orange blossom with a hint of Chimay type esters. Overall: The previous tartness has faded. This mead has shaped up nicely. I like the Belgian esters in this particular mead. Other varietals may suffer. Choose wisely. Aroma: Grape and orange blossom with laser focus. Taste: Slightly tart orange blossom with a hint of peach. Starting to develop a Chardonnay-type butteriness and improved mouthfeel. No fusels or clove flavors detected. Some white wine yeast esters detected. Overall: This is really excellent. It's like a wine yeast based mead without the long aging time. I bet this will be a hit with many mazers. Aroma: Very focused orange blossom. The perfume strength has improved greatly, but still not as strong as others in the group. Taste: Definite orange blossom with some bread flavors. Laser focused with a Pinot Grigio tartness. Overall: Pinot Grigio mead. Nuff said. Aroma: Equal nose of grapes and orange blossom. Very nice. Taste: Very light bodied and very tart. Lots of orange blossom, but too tart for me. I think wine drinkers would be pleased. Perhaps a sweet mead to balance the tart would work well. Overall: It's actually very good, just too tart for my tastes. Has grape-like esters that are different from most wine yeast. Aroma: Very light Orange blossom aroma. Sulfur is gone! Taste: Light and dry orange blossom. Perfect tartness. Slight bread flavor. Slight implied sweetness. Overall: As I stated, age cures all ills. This mead has drastically improved. I look forward to its progress. If this yeast was fed more nutrients, it may rank near the top of the list. To be honest, they are all good in their own way. I have hope Nottingham will move up the list next time.